When the biggest AAA titles keep their utmost focus on the ability to provide players with the most thrilling narratives, captivating gameplay, and precise control mechanics, there’s a genre out there that isn’t concerned with such nuisance! Of course, we are talking about the simulation genre. There most certainly are some weird simulation pieces out there on the market, however, none can deny – there are quite a few of the good ones as well! The very best simulation games often take on niche topics, and we the players, are more than willing to accept such developers’ decisions! Truth must be spoken, back in the day, when the simulation genre was just emerging from the very depths of the idea realm, quite a few micro-manage-y titles have risen to the PC gaming scene, these were mostly of Sim and Tycoon origin. The idea was to provide the player with complete control of everything and anything that is happening. Even today some of these games are blasting the market with their sale numbers that do compete with the most technically and graphically advanced titles on an equal footing! However, in our humble opinion, the very best simulation games are of different origin, their idea is quite different as well. The best simulation games, or at least that ones that we consider to be the best, allow players to immerse in the roles that otherwise would be rather unapproachable to the vast majority. Participating in a war, harvesting the far and wide planes with the latest-tech machinery, building, and piloting a space rocket, or simply driving across Europe loaded with a cargo sounds attractive, doesn’t it? Well, for us, that’s as attractive as virtuality can get. In the hopes that you share the same vision and interest as some of our team’s most experienced players, we present you with a list of best simulation games worth every moment of your time, and every drop of your effort. If you’d like to acquire any of the following titles, visit our Eneba Marketplace! 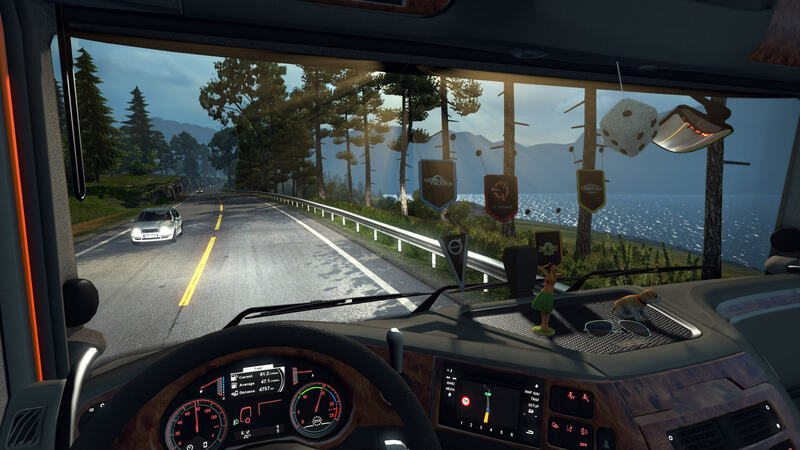 We start our best simulation games recommendation list with Euro Truck Simulator 2. The game was developed and released by SCS Software back in 2012, and it’s still a wrecking ball today. The game has an insane amount of DLC and it’s a bit more than just one of the best simulation games, it’s a simulated experience. Euro Truck Simulator 2 is a relaxing game if you wish it to be relaxing, however, it can also become extremely challenging if you put your mind to it. Drive a cargo from point A to point B and enjoy the sightseeing while you’re at it or try to create your very own delivery empire! Hire other drivers, rent, and buy multiple trucks, purchase garages and plenty more! Customize your truck and hit the virtual road, you’ll instantly feel the vibe that the game is built upon! Another great title among the best simulation games is the Farming Simulator 2019. The industrial corporate life may get a bit stressful at times, and a form of escapism can do wonders. This brilliant piece offers the simple kind of life: grow crops, plough fields, and work at the farm surrounded by beautiful nature, sounds peaceful? It most certainly is! While on paper it may look a bit dull, once you start it up, the ink fades off into the mist. We consider it among the best simulation games because it’s an incredibly detailed piece that portrays the real farming experience to perfection. Not to mention the graphics, which come close, or in some cases even surpass that of our own reality. The birds are chirping, the dogs are barking, the horses are clippity-clopping, and life is chill and beautiful. Try it! Even if you‘re not a fan of football, you most definitely have heard about Football Manager 2019. It‘s one of a kinder amongst the best simulation games, as the game practically doesn‘t have any limits when it comes to your team‘s management. Scold and motivate your players, set up team plans, prepare before- and during-game tactics, train your weakest links, and do everything in your power to become the most successful manager you can. We consider it as one of the best simulation games for a reason: the game provides you with literally every tool you need to make this vision into (digital) reality, and in our opinion, the game can also be used as an unprecedented training platform for real-life situations! It‘s true — the learning curve on this one is quite steep, especially if you are just getting into it, but the 2019 release has an awesome tutorial system, with multiple introductions and induction schemes to ease your every step! The pitch awaits! This one, in particular, is in the best simulation games list because of its immeasurable entertainment value as well as its value for cooperational activities! Keep Talking and Nobody Explodes was released back in 2015 by Steel Crate Games, and it‘s essentially a two-player bomb defusing experience! You have your bomb, you have your defusal manual, and you have your two players, one holds the bomb, other — the manual. The goal in this simulation game is, of course, to not die, and only by a lengthy and adequately put discourse, can the players achieve the goal and thus live to play another day! Last, but far from the least amongst the best simulation games is Cities: Skylines. This is a simulation game that we‘ve decided to include because we love city-building Sim, and really none can compare to the capabilities that invigorating piece offers. In the very beginning you start with but a small town, and with enough time and effort, you can grow it into a buzzing metropolis unlike any the world has seen before! Monitor your population‘s growth, it‘s happiness and income. Plan out entire neighbourhoods and later, entire districts. Constantly balance between functionality and effectiveness and in the most general sense, be the omnipotent god that your residents most definitely need!